The Library has moved!!! The new library is located in the I.O.O.F. Lodge Building, US Rt. 219 & 250, about 3 miles South of Elkins. The New Membership Year begins April 1, 2012. Search our collection at the Allegheny Regional Family History Society. Searchable Census Information for some West Virginia Counties, 1850. The Journal of the Allegheny Regional Ancestors. Publications available from ARFHS for your collection.-- On-Line Ordering Now Available! Genealogy of Early Dilleys Born in Virginia and Some Descendants. Additional Research of D. Armstrong. Information on the SHAY family. Tools, other places of interest, other on-line genealogical resources. Other Researchers and Organizations of Regional Interest. About ARFHS and its members. Please read our copyright/disclaimer notice. 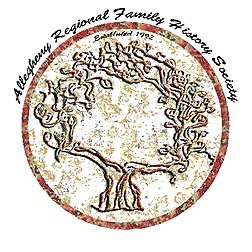 Please send comments to Allegheny Regional Family History Society. Special thanks to Southwest Cyberport for their assistance in making this project possible. Last Modification: September 15, 2010.